Sofia is a Senior at Haverford High School and has been singing at the Music Festival since it’s inception. She is a member of the Concert Chorale, the Tri Music Honor society, and the PMEA District chorus for two years running. Playing the piano since the 2nd grade, she asked for a guitar when she was 10 and started playing live the next year! Performing at local happy hours, coffee houses, Heritage Festivals, Octoberfest, Sofia sings covers from many different times. 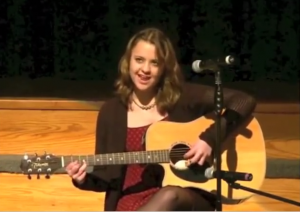 Haverford township is rich in musical talent and Sofia is honored to represent our township.